Product prices and availability are accurate as of 2019-04-12 06:12:33 EDT and are subject to change. Any price and availability information displayed on http://www.amazon.com/ at the time of purchase will apply to the purchase of this product. Student Version 2.0. Correlating software for the one of the most complete music theory courses ever! Available in three separate volumes or as a complete set, the software includes concise lessons with short exercises, ear-training activities and reviews. The Essential of Music Theory Studio Version CD-ROM is an all-in-one series that includes concise music theory lessons with short exercises, ear training activities, and reviews. The educational software includes narration, animated examples, and clickable elements for aural reinforcement. 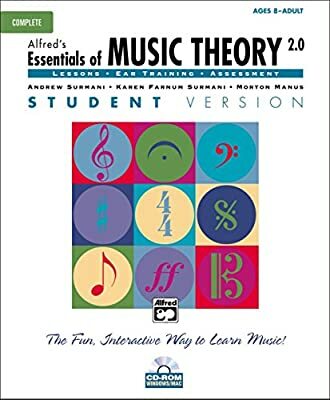 Essentials of Music Theory also includes randomized exercises, ear training, and review answers. A glossary of all music terms and symbols with definitions, pronunciations, and visual and aural examples is also included. Winner of the prestigious Parents' Choice Gold Award and Children's Software Revue All-Star Award. Appropriate for ages 8 to Adult. The student version of the software allows optional study of Alto and Tenor clefs and printing of individual scores. It is MIDI compatible on selected screens and allows for the unlimited creation of student records. This version is intended for one user at a time and is ideal for private study or when tracking progress for other users is not necessary. Available in optional Educator Version and Book/CD format as well. PC/Mac.